It was a chance online discussion that led to me being introduced to the folks behind Creative Crew Singapore. They (actually one guy in their core team, Linus) asked about the use of library premises for their meet-ups. It happened that one of my latest work task was to seek people/ groups who were interested in setting up "activity-based clubs/ communities" with the Public Library. 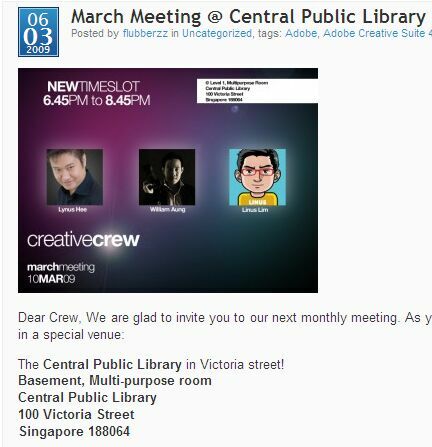 So several midnight online discussions with Linus and a face-to-face meeting with the Creative Crew SG core team later, we're running a trial session at Central Public Library on 10 Mar 09, 6.45pm. Admission is free. Anyone can walk in and attend the session. BTW, if you noticed that I'm speaking on the same 10 Mar session, I assure you I didn't coerce those guys into letting me talk! They felt Creative Commons was a relevant topic and they'd like to know more. Most apt to get more creative crews into the Creative Commons movement, don't you think? The Creative Crew Singapore is quite well-established. I was impressed at how they organised themselves and the content covered in their meet-ups. Creative Crew is the official Adobe User Group for Photoshop and After Effects. Based in Singapore, Creative Crew has the aim to share and spread techniques and tutorials for both Print and Video. Oh, if you'd like to know more, or have ideas, about the "activity-club" thingy in public libraries, email me. Think keywords like: lifelong learning, social spaces, engaged society. A small step towards Re-thinking about Libraries, if you will.